Located on the Edgar Quinet Street, in the heart of the city, the new Mesteshukar Boutique is imagined as an experimental journey. It features an art gallery, that offers an opportunity for seemingly different elements to intertwine: tradition and design, old and new, the craftsmanship and the designer. This juxtaposition gives rise to unique pieces of art. Different experiences are brought together through materials, textures and colors. The design expresses the manufacturing culture in a contemporary approach. Similar to an art gallery where the visitor does not feel overwhelmed, the design allows focus on each exhibit. Each object has to breathe, have a life of its own and mark its individuality and uniqueness. Its traditional materials give the interior an inviting warmth, while its morphology and chromatics align with contemporary design. Materiality was an important consideration. The wicker wood, apparent concrete, traditional white washed plaster and the recycled wood are all part of the Mesteshukar Boutique’s tribute to simplicity and honesty. Textiles with traditional motifs (ceiling, behind the reception/coffee area) are used to mark the areas of interest, gathering and socializing. By offering an alternative to the typical mass produced display, it offers a distinctive modern interpretation of the vernacular. Sustainability is a key element in the design concept. Most of the proposed elements are made from recycled materials such as wood, metal or textiles. Following the goal of resource economy, the exposed concrete flooring is preserved. Inspired by the traditional materials and textures of the Roma and Romanian culture, this design aims to reinvent the art of exposition. The interior design exhibits contrast through textures, vibrant colors and shapes. The two main walls are intended for product exposure. 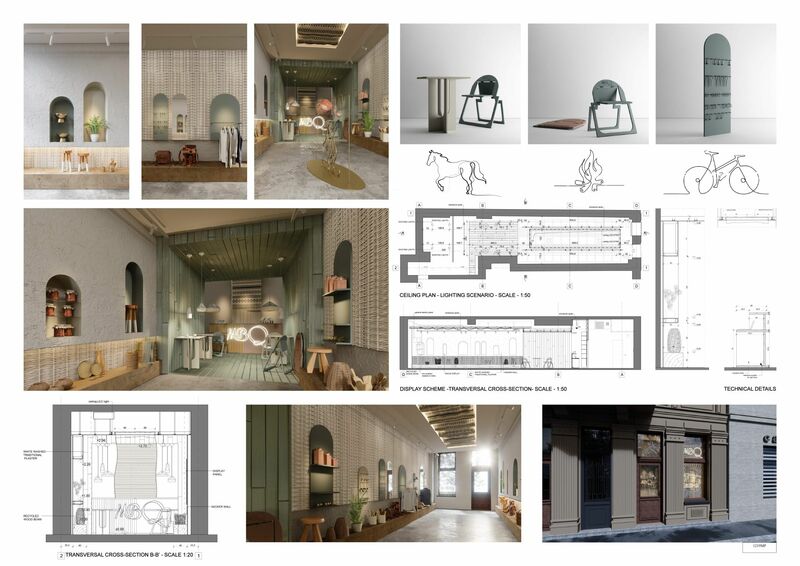 The design of the niches and jewelry displays is based on arch motif, which references both focus and character. The design symbolically encourages sustainability. Metaphorically the matter ‘dug’ in the left-hand wall is reused to expose objects to the right wall. The focus is on the product itself, while the display enhances the customer’s experience. To allow rearrangement of the shop layout, both of the custom pieces of furniture (chairs, tables of the café area) and the displays on the left are easily moved. Several elements from the exhibition arrangement, and the materials and colors inspired by nature, give people a taste of the manufacturing culture. In the central area, metallic threads embodying craftsmen culture form a novel method of exhibition that can be modified and adapted. This represents the essence of both craftsmanship and creativity, and gives objects the chance to tell their story. MBQ puts a strong emphasis on the link between the designers and local craftsmen, inspiring the artisans to create the exhibition elements in the boutique. Both the central elements and the window display are created by them. Visitors are greeted with a symbol from the Roma culture which creates the signature Mesteshukar products (a caravan, in the proposal). The window showcase uses the same elements and materials as the interior architecture, placing the emphasis on manufacturing culture. The visitors also have the opportunity to get a closer look at the traditions and handcrafts which offer a window into the culture. 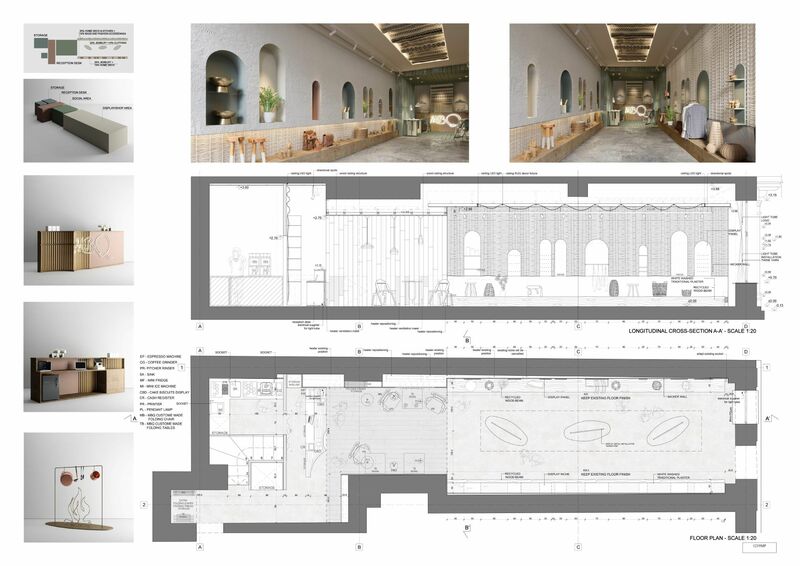 At the end of the experimental visit is the cafe and the working space – a place of relaxation and repose, where visitors can enjoy a cup of coffee. Mesteshukar focuses on interaction and socialization, therefore the social area is marked by color and texture change. The perception of the spatial dimension (a long, narrow, unfriendly space) is improved by placing a meeting and coffee area in the last third of the boutique. The design choice aims to visually separate the socializing area from the exhibition area. The furniture, easily foldable or removable, affirms the design choices of the other exhibition areas. MBQ becomes a sensory experience for the people who decide to cross its threshold.